The February 26, 2008 election approved the Option 1 revenue allocation plan. This approved RAP reduces Economic Development to our actual development expenses. 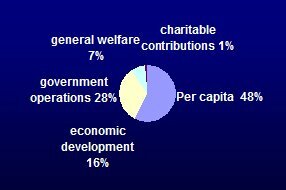 General Welfare will include Social Services, Housing, Education, and other welfare programs for our membership. Government operations would include Health Clinic, Public Works, and other functional government programs. All budgets have been adjusted to reflect the per capita increase to 48%. The revised RAP was submitted to the Bureau of Indian Affairs, they have 90 days to make a decision on their approval or disapproval. (e) To help fund operations of local government agencies.